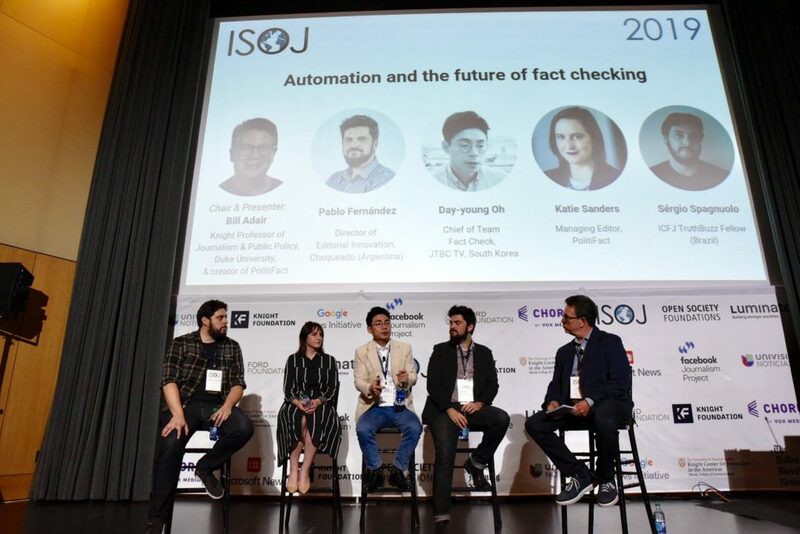 That was the general takeaway from the International Symposium on Online Journalism (ISOJ) panel “Subscriptions and memberships: Reinventing the relationship with your audience” April 12. Chartbeat founder and Scroll CEO Tony Haile told ISOJ attendees that he’s currently working on how to “get the underlying economics right” to make journalism financially sustainable. The bad news is he hasn’t figured it out yet. But the good news is there’s a lot of work being done on journalism membership and subscription models, which could hold the answer. The panel focused on how different publications have implemented subscription and membership programs. In addition to Haile, panelists included the Texas Tribune’s Chief Audience Officer Amanda Zamora, The Boston Globe’s Senior Deputy Managing Editor for Audience Development Jason Tuohey, and Facebook’s Local News and Subscriptions Accelerator Director Tim Griggs. Emily Goligoski, who is the research director for an initiative supported by the Knight Center for Journalism in the Americas called the Membership Puzzle Project, moderated the panel and spoke about the research her group has been doing. According to Goligoski, journalism organizations should look to non-profit organizations and movements in different fields for clues on how to build community and raise money. Churches, environmental movements and open source communities are just a few of the entities a new report by The Membership Puzzle Project examines to determine how journalism organizations can improve community building and fundraising. “We see that inspiring membership-driven organizations connect individual’s passions to greater purpose,” Goligoski said. Looking within the journalism industry reveals some best practices, too. Griggs, who was on the team that implemented a paywall at The New York Times, said there was a lot of push back to that paywall at first. But subscriptions now bring in hundreds of millions of dollars each year for The Times. But Griggs cautioned against simply copying The Times’ subscription model. There are different reasons people pay for journalism, he said, some pay for journalism because they need it to make choices, some pay for journalism because they believe in supporting it, and some people pay for journalism because they want to be part of a community or club. The New York Times and The Boston Globe, which have paywalls and subscriptions, attract people who fall into the first and second categories, while the Texas Tribune attracts people who fall into all three. The Texas Tribune is a non-profit online newsroom with a membership model. The publication’s content is free and it hosts in-person events that are open to the public, as well as some members-only events. The Tribune fundraising model is similar to public radio or public television. It runs spring and fall membership drives but relies heavily on underwriters to support its reporting and events. “We hope that our journalism is so important and meaningful that people are inspired to support it because of its value and relevance,” Zamora said. Whichever model an organization chooses, a few rules apply. Focusing on new subscribers or members at the expense of current ones does not pay off, according to Zamora. “Funneling” readers into a subscription or membership by using content, like a newsletter or feature story, to hook them and then asking them to pay often works. The Boston Globe has done this both ways, according to Tuohey. He knew that a multimedia feature on Aaron Hernandez, the infamous former New England Patriots football player, would bring new eyes to the site, so he implemented a free trial that readers could sign up for. Over 70 percent stayed on after the trial ended, he said. The Globe also found success with a free newsletter on marijuana that turned into a mini-site and then a paid newsletter, according to Tuohey. Finally, making the process as smooth as possible is important for both membership and subscription models, according to Haile. Livestreaming of ISOJ in English and Spanish can be found at isoj.org.